Ford Motor Company pulled its advertising from the News of the World and other big names were considering doing the same after mass internet campaigns by members of the public angered by sickening revelations the paper hacked into the phone of a teenaged murder victim. When the allegations were made this week that a private investigator eaves dropped on Milly Dowler's mobile - even deleting messages on it so he could listen in on new ones - a wave of rage swept through Twitter and Facebook. But a few people decided that they needed to do something practical to punish Britain's biggest-selling publication. They used social media to mount an extremely effective campaign to dissuade advertisers from using the News of the World. First, @the_Z_factor, as Melissa Harisson calls herself, got home from her work as a sub-editor and started discussing on Twitter practical ways of hitting the paper where it might hurt. "I don't know how you'd locate News of the World readers," she explains," but anyone can see the advertisers". She started tweeting the names, and soon found her phone beeping all the time as the messages were rebroadcast. One of those retweeting was Andy Dawson, who goes under the tag @profanityswan. He said: "I sourced some more advertisers from Sunday's News of the World and urged my Twitter followers to copy and paste the tweets if they felt strongly about the hacking story. Within about 90 minutes, it had started to snowball and my timeline was filled with people tweeting at various companies." Next another tweeter @thegreatgonzo put together this page to automate the process of tweeting a message to the companies. And then @eroticpuffin weighed in. Behind the name is Paul Friend, manager of a GP's surgery in Dewsbury, UK. He put together this site, complete with a spreadsheet containing the names and e-mail addresses of the chief executives at firms said to advertise with the News of the World. The idea was to allow people to take the database and mail all the CEOs at one. "I didn't want to make a great statement just to make people aware of what had been going on. And we had to do it fast or the impetus would be lost," he said. "Please be careful not to make unfounded statements in your email, just express your concern as a citizen and consumer. " We can't be sure how many people responded to the campaign but it was certainly very visible on Twitter and Facebook, and the site with the Tweet This links had more than 40,000 views in 24 hours. Npower and Halifax have said they are considering their options regarding advertising in the NoW, representing the potential loss of more a million pounds of revenue. It cannot be discounted that the advertisers made up their own minds about the News of the World, rather than simply responding to a flood of e-mails inspired by Twitter but I would guess that people power on the internet made the difference. A random collection of loosely organised people with no one leader have come together to deal a blow to the finances of one of the world's most powerful media organisations run by the control freak mogul Rupert Murdoch. BBC technology correspondent Rory Cellan-Jones said: "Such an outcome, delivered at such speed, would not have been possible five years ago and is another measure of the growing power of the social media phenomenon." Mass internet campaigns following sickening revelations Britain's best selling paper hacked into the phone of a teenaged murder victim has sensationally forced it to be axed. After big name firms pulled advertising from the News of the World its owner announced it would close. This followed damning allegations made in the Guardian this week that jailed private investigator Glenn Mulcaire eavesdropped on Milly Dowler's mobile - even deleting messages on it so he could listen in to new ones. A wave of rage swept through Twitter and Facebook as a result. The paper quickly lost most of its advertising worth millions of pounds. Sainsbury's supermarket, Halifax building society and O2 followed the example of other companies including Ford and Npower by suspending advertising in the NoW. Then mobile phone firms T-Mobile/Orange, Renault and Mumsnet said they were considering doing the same. The public's fury was made worse when it was revealed by police investigators, themselves accused of corruption over the scandal that reaches as high as British prime minister David Cameron, that the phones of the families of high-profile murder victims and dead soldiers and people killed in the 7/7 London bombings may also have been illegally tapped. James Murdoch, boss of the News International Company that owns the News of the World, told staff on Thursday night he was shutting the paper after Sunday's edition. He commented: "The good things the News of the World does, however, have been sullied by behaviour that was wrong. Indeed, if recent allegations are true, it was inhuman and has no place in our Company." He added: "The News of the World is in the business of holding others to account. But it failed when it came to itself." 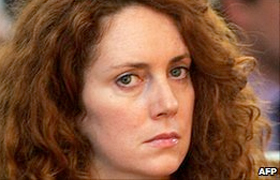 There have demands for ex-News of the World editor Rebekah Brooks to resign. 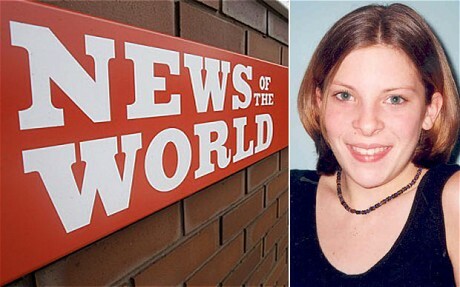 She is now chief executive of parent company News International, based at Wapping, London, and editor when Milly Dowler's phone was hacked into. A few people online decided that they needed to do something practical to punish Britain's biggest-selling publication. They used social media to mount an extremely effective campaign to dissuade advertisers from using the News of the World. A Facebook campaign to boycott the News of the World has won huge support. In a statement, Ford said it would be using "alternative media within and outside News International Group instead of placing Ford advertising in the News of the World" while it awaited the outcome of an internal investigation. The company added: "Ford is a company which cares about the standards of behaviour of its own people and those it deals with externally." A random collection of loosely organised people with no one leader have come together to deal a blow to the finances of one of the world's most powerful media organisations run by the control freak billionaire Rupert Murdoch.